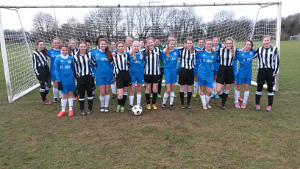 Congratulation to Leicester City Ladies new minis side on their first games. 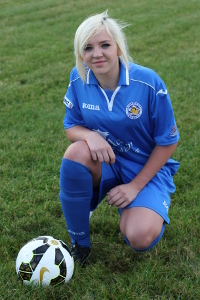 Since the summer Leicester City Ladies have been looking to rebuild their Minis section . 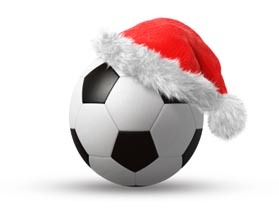 Hosted at Judgemeadow ports hall with teams from Abbey Primary, Barwell Academy, Montrose Primary and of course Leicester City Ladies Minis, the girls played out a fine Christmas based tournament in a great spirit. 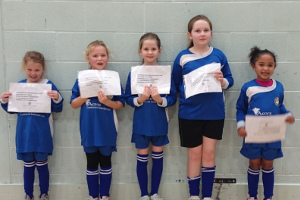 Well done to Mairead, Alannah, D’nayea, Olivia and Macie who made up the Leicester City Ladies 5 a side team . 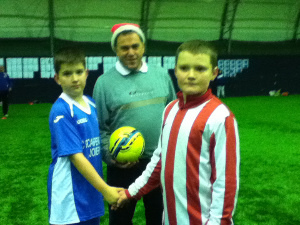 Sessions will resume on Thursday January 15th at St Margarets Pastures with a 6pm start. Top of the table Leicester City Ladies Diamonds snatched a last minute 3-3 draw against 2nd in the table Oadby Owls to keep their unbeaten record intact although Oadby Owls would feel aggrieved as they were the better side on the day. 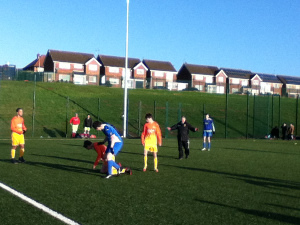 The 2nd half started similarly to the 1st half and Oadby were again in control. They scored again to make it 3-1 and to be honest there only looked one winner. However one thing about our girls is they never give up. Changing to a 3-4-3 formation they got back into the game when Lauren slotted the ball away nicely and all of a sudden Oadby Owls were on the back foot at last ! Leicester continued to press forward in the last 10 mins and were let off the hook when the Oadby Owls striker missed a good opportunity to win the game. This galvanised Leicester into a final push and with a minute to go a superb corner by Olivia D found Lauren in the box and she did an overhead kick that was going in until an Oadby Owls defender tipped it round the post and a penalty was awarded. 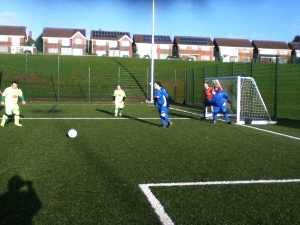 Molly kept her nerve and scored to make it 3-3 and an unlikely point was gained. Credit must go to both sets of players for a honest and battling display and also to the referee who was superb. Full Time Leicester City Ladies Diamonds 3 Oadby Owls 3. Leicester City Ladies bounced back from last weeks disappointment in the FA Cup in a superb way at table topping Leicester Women. Good organisation and structure frustrated the home side limiting changes in the first half. In the second period the game opened up a little more with chances for the home side and Chivers, Kilby and Hillier all unlucky for the Ladies. LCLFC stood firm and secured a vital point on a tough playing surface. 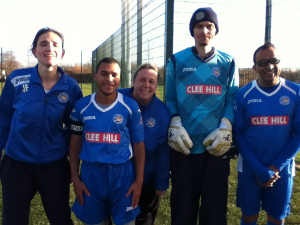 Leicester City ladies record their 6th clean sheet of the season so credit to all . As part of Leicester City Ladies work in the community I am organising a day of visits to Elderly Residential Homes by players from the club. The aim is to spend a small amount of time in each home delivering gifts in the form of hampers and some Christmas cheer. The plan is to meet at 9.30am on December 23rd in St Margarets Pastures car park and then together plan a route to visits the homes, all of which are in the Leicester area. If you can help in any way please contact me, thank you for your support. 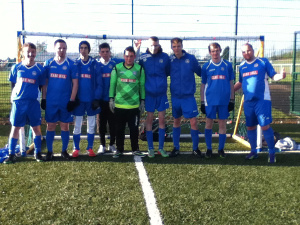 Leicester City Woodgate Adult Teams were invited to play in the Midweek Inclusive Football League held at the New Ellesmere College site on Wednesday 10th December. 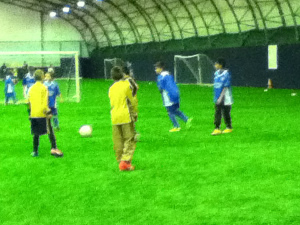 We had four teams in the event and played against, Northampton Town, Leicester, Gateway and Ellesmere Colleges and the Achieve with Us team. 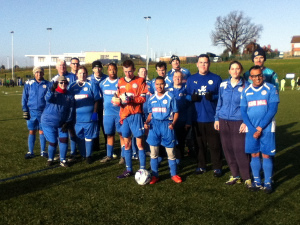 Fair Play and Respect was on display by All players and the days’ event was very well organised by Philippa Bass, Football Development Officer (Disability) at the Leicestershire & Rutland Inclusive Football Partnership. There was some great skills and team work on the day and ‘Player of the Day’ awards were given to Kerry Litchfield, Julie Freestone, Owen Billington and Alistair Johnson. 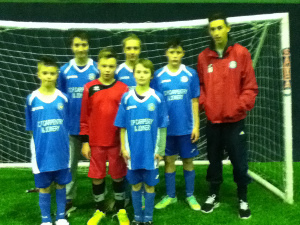 Special mention to an amazing performance in goal from Owen, who made some absolutely fantastic saves! 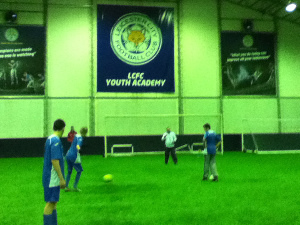 Leicester City Woodgate Junior and Youth Inclusive Teams played at the Leicester City Indoor Dome on Saturday 6th December in the Leicestershire & Rutland Inclusive League. 10 teams attended the event overall with our Junior and Youth teams taking part against Oadby & Wigston, Ibstock Utd, Birstall Utd, Asfordby Amateurs L & G Inclusive, Harborough Town, Aylestone Park. Inclusive Football gives a fantastic opportunity for players with a variety of needs to be a valued team member and learn skills that support their personal development as well as their football skills. Saffron Lane, Leicester, LE2 6TG.